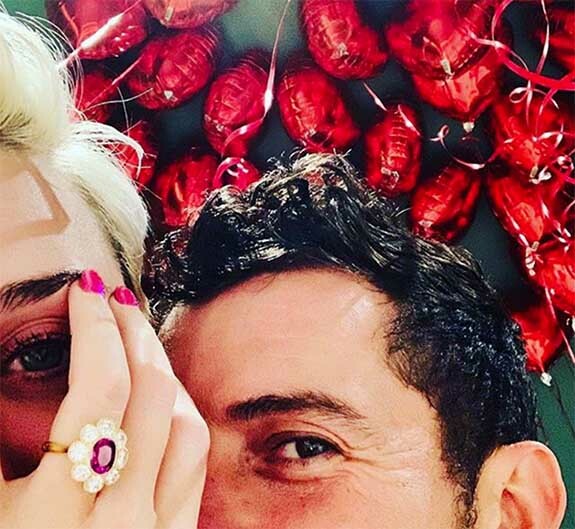 Pop star Katy Perry announced her Valentine’s Day engagement to Lord of the Rings alum Orlando Bloom with an Instagram selfie showing off a ring with a deep pink center stone in a flower-shaped diamond cluster setting. Perry and Bloom have yet to confirm the identity of the oval-shaped center stone. Some pundits believe it’s a ruby, while others are calling it a pink sapphire, or a pink diamond. That’s why the same experts have offered a wide range of retail values — from $25,000 to $5 million. The oval gemstone is estimated to weigh 2 carats, while the eight complementary diamond “petals” are estimated to weigh a total of 2.5 carats. Antique jewelry expert Stephen Feuerman told harpersbazaar.com that Perry’s new engagement ring reflects a cluster style that first became popular at the turn of the last century. Since then, the style has been revived in a number of famous engagement rings, including the blue sapphire and diamond ring that Prince Charles presented to Princess Diana. More recently, Princess Eugenie’s engagement ring featured a cluster setting with a padparadscha sapphire at its center. People.com pointed out that Bloom seems to have a fondness for cluster-style engagement rings. The ring he gave to Kerr was similar to Perry’s, except that Kerr’s had a diamond center stone and was set in white metal. Perry’s has a colorful center stone and is set in yellow gold.